Slavery ended in New York State in 1827, yet this victory did not sever the city's connections to enslaved labor. New York City capitalized on the expanding trade in southern cotton and sugar to become the leading American port, a global financial center, and a hotbed of pro-slavery politics. At the same time, it nurtured a determined anti-slavery movement. In less than half a century, abolitionists convinced many northerners that American slavery could not be reconciled with American freedom. Conflict between the two sides, one favorable to slavery and one opposed, was all but inevitable. New York Divided, the second of two major exhibits, draws from the New-York Historical Society's rich collection to explore the turbulent half-century of the city's history with southern slavery. Select one of the three themes below to enter the exhibit. 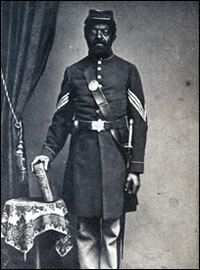 Civil War Soldier. J. Oldershaw, photographer, 1864. Photograph print on carte-de-visite. Beinecke Library, Yale University.